People are still sending in submissions to the flashblog! “My name is A.W. and I am 9 years old. I watched “Autism Every Day” and I hated it. I don’t even know if I want to talk about it either. It made me really sad when the lady said she wanted to drive her kid off the bridge. You’re not supposed to kill your kid just for no reason, just ‘cause of autism. And they weren’t teaching the kids right. Why did that person grab the boy’s hand? When he was stimming he was happy. When they grabbed his hand, he felt trapped and started crying. Why were there so many white people in the video? Does Autism Speaks think Asians and Hispanics and Blacks don’t have autism? Why weren’t there any dads? Maybe the people were mad because they got divorces and decided to blame their kid and blame autism. Who cares if you can’t have a bagel? Take it to go. At least you have a kid. Lots of people have something different about them. At least they’re alive. Those people made me sad. They need to try harder to like their kid. Autism Speaks is really bad for people who don’t know anything about autism. And for people who know about autism. I couldn’t show my mom what I wrote after watching the video because the video made me mad and I wrote a lot of bad words and curse words about autism speaks. I’m not going to write them here either, but I am going to say why I am proud of my family for boycotting. I am proud because my mom and my little brother and sister are autistic. They don’t need to be cured and people who are pregnant who find out the baby might be autistic don’t need to kill their kid because the kid is autistic. Autistic people are not some monsters. They are really smart and they have their ways of doing things just like we have our own ways of doing things. I would never want someone to try to cure my family because they don’t need to be cured. Autistic people need help but so do other people with disabilities and people with no disabilities. We all need help with stuff. A lot of people know about autism speaks and they could help people understand autism better but instead they make people scared of if. I have a disability too and it makes me sad to think maybe someone could have though I shouldn’t be born. I think the world is better because of autistic people. When my little sister was small she didn’t talk a lot. We had to figure out how to understand her without words. It takes longer but it isn’t bad. Just cos something is harder doesn’t mean it’s bad. It’s harder to comb long hair than it is to comb short hair but no one says all long hair is bad and we should get rid of it. Different hair works for different people. When i tell people I have autistic people in my family they say they’re sorry. They think it’s a sad thing. I don’t want people to think that. No one says they’re sorry if you say your favorite color is red or your favorite color is blue. They just say ok. I have to keep boycotting until autism speaks decides to change because i don’t want any other kids to think they should have to be ashamed of autistic people. I love my mom and my little brother or sister just the way they are. I don’t care that they are autistic and you shouldn’t care either. Crusading against hate! autism speaks founders are NOT heroes! Our last flashblog entry. This came in late, but we thought it was important to share…..
hello,Recently People magazine featured bob and sussan wright as “heros among us” They got a huge cover page and a story of coarse but here is the thing People if you had done a little research first on your subject matter you would have learned very quicklyBobs and Susan wright are NOT heros! there is nothing heroic about dehumanizing Autistics! there is nothing heroic in spread fear and stigma for your personal gain! there is nothing heroic about make an entire group of people feel like burdens and curses to their family! there is nothing heroic about SHUT OUT the people you claim to speak for and silencing their voices! there is nothing Heroic of parading parents in front of a screen to cry and say how much their child has ruined their lives! There is nothing heroic about painting parents and caregivers who murder autistics in their care as victims faced with a horrible burden and turning the murder victims into the villains! There is nothing ok about demonizing the person who’s life was taken from them and turning the killer into a matter in a cry for more help! Bob and Susan wright are NOT HEROS!!! Autism speaks hurts #actuallyAutistic people! the little good they have done pales in comparrison to the pain suffering, tears and harm they have caused building barriers of fear between Autistics and the community! Period! Painting autism as something to be feared, to be battled paints autistic as less, so often you hear parents of autistic kids fearing what will happen to their kids when they die, well how you speak of autism will effect the answer to that directly, The message you send to the world is about autism and autistic is how autistics will be viewed. No one with autism no matter how mild or severe is less than human because of their challenges, challenges don’t take away from your humanity! Bob and Susan wright are not heros their organization shuts out and fights to silence autistics and silence our voices, they spread stigma and fear and excuse murder that is not heroic! if you want to feature real heros look at the Autistics and our families who are fighting for acceptances, understanding and supports that actually benifit autistic people.look at people fighting the stigma and demonetization of Autism because in a world the tells you we ar lost, broken and burdens the true heros are the ones who stand with us in love support and acceptances who lift up our voices, We are not broken, we are not lost we are here we matter and we deserve to be heard! So if you want to highlight heros highlight Autistics, high the parents and allies in autism acceptance who support neurodiveristy and acceptance those are the real heros!! I #BoycottAutismSpeaks for many MANY reasons. All of which every person supporting this hate group should see in order to realize what they’re REALLY supporting. I #boycott because I do not support organizations that spread hate, fear and lies. I #boycott because I am NOT a disease! I #boycott because I don’t need or want to be cured of who I am! I #boycott because I REALLY do not believe in supporting organizations that make murder seem justified! I #boycott because toxic, stereotypical claims about Autistics that this organization has spread was one of the MAIN reasons why growing up for me was so hard; NOT because of the fact that I was Autistic! 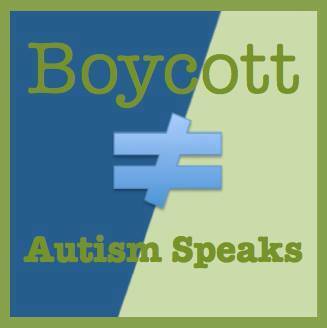 I #boycott because I love myself and actually care about other Autistic individuals out there! 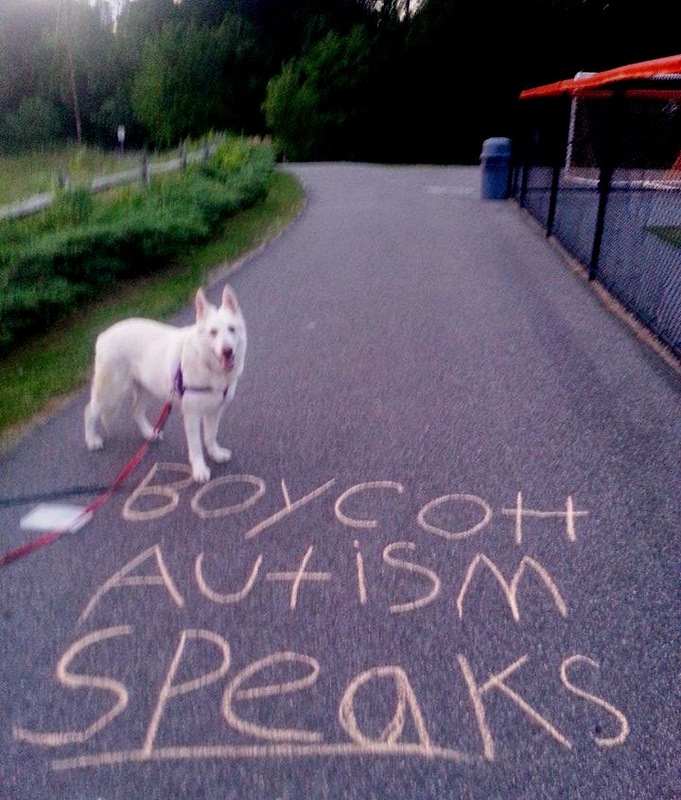 I #boycott we Actually Autistics do not need neurotypicals to speak for us! I #boycott because I do not believe in dehumanization. I #boycott because we are PEOPLE not PUZZLES! I #boycott because I believe in Equality for ALL! I #boycott because Autistic lives MATTER! I #boycott because we are NOT missing! I will continue to speak out against hate, discrimination, dehumanization, and pity. It’s only because of people like the ones behind this hate group they call a “charity” that #ActuallyAutistics like me have been undeservingly looked down on as a “epidemic”. A couple of months ago, my brother sent me a text. Did I want to go to the Autism walk with him and Em? Me: They promote a tragedy model of autism and act like the desire to murder your kid is understandable to have? Also they refuse to have any autistic people at all on their board and the one guy who was on their advisory quit because they didn’t listen to anything he told them. Only 4% of their budget goes to families. Most of the money doesn’t make it back to the communities it comes out of. Instead it goes to their media machine. Wil: I see that’s lame as hell we were going to go but not anymore that’s way messed up. Me: Next [time] you are on YouTube google Autism Every Day to see a mom talk about wanting [to] drive herself and her kid off a bridge IN FRONT OF SAID KID and not doing so because of her non-autistic child. Or the I Am Autism one where they took film from families not telling them that the voice over would be about autism destroying families. ❤[heart emoji] Thanks for listening! Wil: Yeah I’ll check ’em out thanks for the info. We were gonna take her parent’s car and go ‘n bring you along but after hearing all that we were both like nooooope. Let’s be honest; is anyone surprised at this article? I mean, yes, it wasn’t expected, but was the content at all surprising to anyone who has autism or is one of our allies? Bob & Suzanne Wright have, both personally and through their organization, pushed a narrative that posits a view of autism as some sort of debilitating, dehumanizing disease that not only destroys the individual, but also their family. We have witnessed this brutal message time and time again over the past 10 years; even when someone with autism joined one of their boards, the message stayed the same. For example, Suzanne Wright wrote blog post a couple years ago (http://www.autismspeaks.org/news/news-item/autism-speaks-washington-call-action) defining autism as not a neurological difference, but some sort of cold-blooded enemy after our nation’s children in some sort of war. Turns out she not only ignored Autistic professionals, advocates and others not connected with her organization, but board members as well (as the resignation of John Elder Robison showed later that year). The ignorant, disturbingly out-of-touch message sparked a lot of anger and rage among those of us with autism – but two years later, it’s all but forgotten, especially by People Magazine. Apparently, being a polarizing, dehumanizing force that doesn’t really help people with autism but claims to do so by trying to ‘rescue’ children seems to be the norm for Autism Speaks. The issues brought up in both articles (lack of proper services, waiting lists, accessibility issues at schools and workplaces) are not caused by autism; they are caused by our society, which has been influenced by an organization bent on developing a cure so its founders can have a ‘normal’ grandchild. Therapies, treatments, specialists, insurance and school services are not under the control of autism – they are under the control of school districts, governments, private corporations and companies, and professional organizations. Aim your angst, sadness and despair at them, not at autism. One of the more prominent fears described in both articles is a false future where apparently all autistic children will grow up and be non-functioning adults – which if People magazine, Bob & Suzanne Wright took five minutes to look around, will find to absolutely not be the case. Yes, there will be some autistics who may need more accommodations than others; however, with the right technology and supports, all will be able to lead an individualized, quality life of their own choosing. But by pushing a narrative that causes many autistics to believe that something is seriously WRONG with them, Autism Speaks tears down and artificially limits any goals, ambitions and dreams they may hold for themselves. How do we tell them that they’re NOT broken, and they can achieve their dreams? How do we fix the damage caused on a national level by Autism Speaks? Most – if not all – questions asked by Bob & Suzanne should be discussed with Autistics. After all, we have the best perspective, experience and knowledge when it comes to questions about treatments and what works – and what doesn’t. Yet we’re continually ignored, and limited to playing a token role for an organization that has worked consistently to harm our path to independent living and a successful life. Unfortunately, despite our constant and very loud voices collectively speaking about this harm over the past ten years, it hasn’t stopped Suzanne nor her husband from sending a clear message through Autism Speaks – a message we have all heard very loud and very clear. In any other case, if you had told me that there was an organization out there that helps people with Autism overcome their daily struggles and acts as an advocate for them, I’d be thrilled. A lot of my own struggles were worked out when others wanted to help, and what with the stigma that others put on us every day, it would be great to have a group of informed, powerful people who could vouch for us. Unfortunately, the people within Autism Speaks are anything but informed. In spite of claiming that they want to help us be heard and give us a voice, they do not speak of desires for us to be looked at as equals or to be given the same chance to succeed as others. They speak of Autism as if it were a pox or a plague, some contagious disease that has the potential to destroy families and even communities. Such a message is not only shortsighted and bigoted, but it is also downright destructive given the amount of power and influence this organization has. One of the worst parts, if you ask me, is that whenever they discuss Autism, they act as though it is the most present thing in the subject’s life, and this encourages people to start thinking that it is the case for everyone with Autism. However, given the amount of people with Autism who are able to live just as well as anyone else, this kind of thinking does far more harm than good. I don’t want people to think of me as “Alex, the guy with Autism”, or even as “Alex, the guy with Asperger’s Syndrome”. I want people to think of me as “Alex, the guy with the friendly, laid-back attitude”, or as “Alex, the guy who makes the funny videos on the internet”. To me, and to anyone else who knows their worth about Autism, it is merely a condition that exists. It does not make up who we are, and should not change how we are viewed. Furthermore, the idea of Autism being the most prevalent thing in our lives is also harmful in the sense of how others think we should be “helped”. When my parents first found out about my Asperger’s Syndrome, they did learn that I would need help overcoming things like social awkwardness and lack of focus. But I wasn’t helped by people who wanted to “cure” me or “fix” me. I was helped by people who knew that I would never fully be rid of Autism, but that wasn’t a bad thing. They knew that the best course of action would be to help me learn how to manage the social awkwardness and lack of focus and allow me the freedom to enjoy my life seeing myself as just another kid at school. Autism Speaks would’ve only seen me as their lab rat. Rather than trying to help me with my actual problems, they would’ve tried to change who I was entirely, not knowing that doing so is not only impossible, but would’ve been getting rid of the parts of me that I like. It is true that Asperger’s Syndrome has caused me to get caught up in my own thoughts many times, but it has enabled me to think deeply about things I wasn’t sure about, and to create ideas for the videos I make and put online. I cannot imagine for a second that Autism Speaks would have cared about that if I had told them. As dangerous as these consequences are, however, there is one danger that outweighs them all: Autism Speaks is not careful about whom it trusts. A month or two ago, I found out about one such organization it supports and actually featured at one of their resource fairs: the Judge Rotenberg Center. The JRC is essentially a reform camp with the methods of a concentration camp: they take away any medication that its patients are on, they see stimming as an action worthy of punishment, and their punishments, which include isolating someone from everyone else and even holding down someone while electrically shocking them, are absolutely draconian. When I heard about this organization, I was so shocked and disturbed that to this day, I have only told a few other people about it. And this is the kind of thing that an organization that dares call itself Autism Speaks sees as a good thing. Autism Speaks may call itself a group of heroes, but all they really do is spread fear and bigotry. Their “crusade” is really nothing more than a witch hunt. They don’t want to help us stand up for ourselves, they only want to keep us silent and pass it off as being our voices. But make no mistake, they are not the voices that we want or need. I am not a defect, or a broken man, or a victim of anything other than the hateful message spread by Autism Speaks. I am Alex Woody, and I will not let the voice of Autism Speaks be heard over mine.